Community Development sits alongside social justice, social inclusion and community leadership on the Regional Council banner as areas we believe and work in. The lines between these areas blur and while there are many definitions of community development Regional Council works in the tradition of Marg Barry who in this issue’s from the vault says “community development is about communities being in control and adequately resourced to solve their own problems!” It really puts people first! The role of groups like ours is to keep the community in community services, community development, community engagement and everything that often pretends to be about community but which does not include local community perspectives. 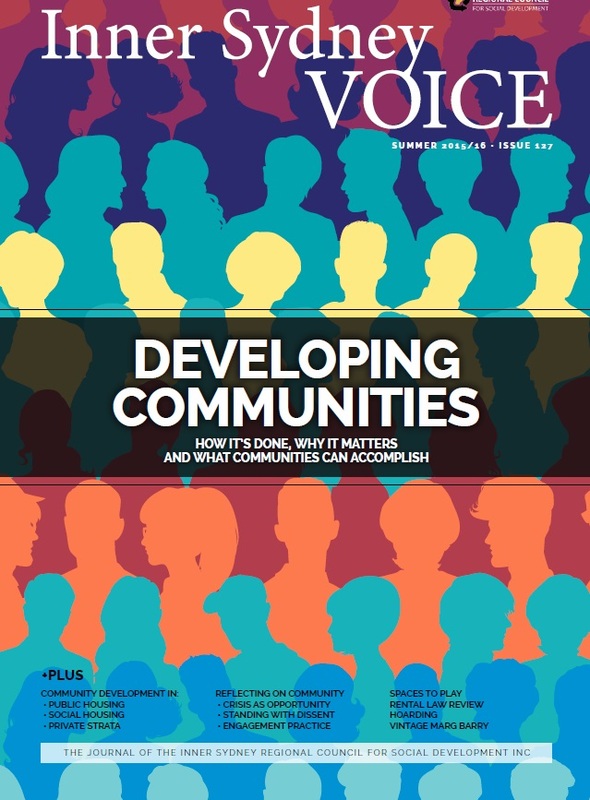 This issue of ISV is about communities being at the heart of what happens around them and needing to have a real say in what happens. It is about organisations encouraging communities to find their voice, defending their right to that voice and amplifying that voice. It is about where the Inner Sydney Voice comes from. We start this issue with Jim Diers reminding us that within every crisis there is opportunity. He encourages us to Seize the opportunity of crisis to rebuild community. We explore three community development case studies that work with public and social housing tenants to help build communities. In Inner West Tenant Group: Bringing tenants together we look at how Rozelle Neighbourhood Centre helped to form this group and at what they are achieving. Another case study looks at Community development in Hunters Hill: What can be achieved by a community garden and art project?. It also looks at some of what cannot be achieved by such a project. The third case study looks at City West Building community in new social housing– developments like The Platform at Eveleigh. People coming together in the new high rise buildings raise issues of how those people might form communities. Strata skills help create communities discuses Sydney Council Strata 101 courses. We asked two experienced community development workers to reflect on what has changed in their time. Neil Stuart discusses community development as Standing with dissent and Julie Spies looks at change in the community sector as Time to Change. Stefanie Pillora’s reflection on Marg Barry and noisy minorities compliments these practitioner reflections and introduces issues related to community engagement. Last issue’s article from UrbanGrowth NSW about community engagement, encouraged responses in the spirit of engagement from two writers experienced in the field. You can read these in Michael Darcy’s The challenge of community engagement and Wendy Sarkissian’s Leading-practice community engagement: some ideas for UrbanGrowth NSW. This issue we also explore places for active recreation in Spaces to play, the issues raised by The Tenants Union in NSW Renting laws under review and hoarding in Beyond the clutter. As Inner Sydney Regional Council celebrates its 40th Anniversary, we look back on Marg Barry’s 20th year predictions Forward to the Future. Did her crystal ball work? Charmaine Jones and Geoff Turnbull co-editors Inner Sydney Regional Council for Social Development.